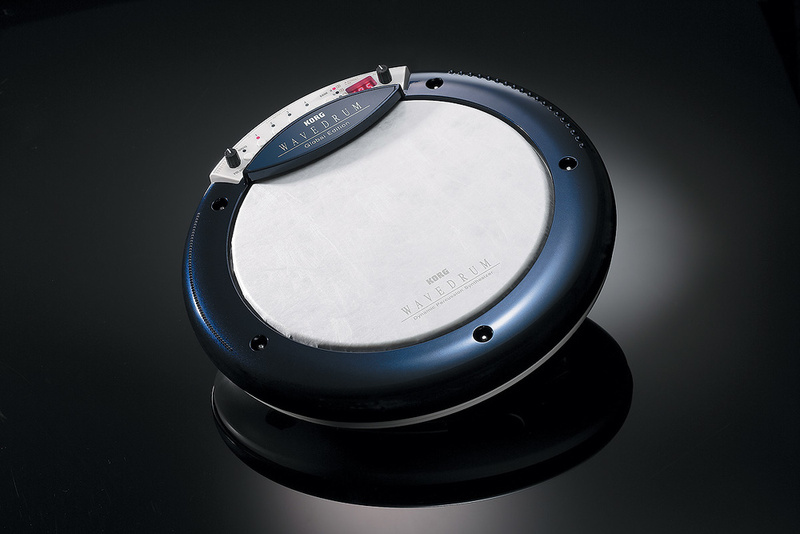 Reintroduced in 2009 (although originally launched way back in 1994), the Korg Wavedrum has appeared in a number of incarnations over the last four years; the Wavedrum X, the Wavedrum Oriental, the Wavedrum Black and, moving in a different direction, the almost toy-like Wavedrum Mini. This year sees the release of the latest, and possibly greatest Wavedrum: the Global Edition. The Wavedrum, for anyone who's not familiar with it, is a percussion synthesizer fitted with three sensors around the rim and head that enable you to play both realistic and positively other-wordly PCM-based sounds created with various synthesis methods, including physical modelling. The fibre-skin head and guiro-style notches on either side of the rim At the back of the Wavedrum Global we find a socket for the external 9V PSU and a power switch, stereo quarter-inch outputs, and headphone and aux in 3.5mm sockets. make it perfect for playing with anything from your hands and fingers through to brushes, sticks and mallets, and the response you can achieve is very organic and 'acoustic' in feel. The sensor placed under the head responds to pressure and allows very expressive playing techniques to be employed. The Global Edition under review here is physically and operationally identical to its predecessors, but this time sports a very attractive dark-blue surround to its case. A cutaway section around the rim houses the control panel, featuring four push-buttons labelled 1 to 4, with their secondary editing function (Live, Edit 1, Edit 2 and Global) printed below and a status LED above. To the right is a simple three-segment LED display (not unlike that of an '80s clock radio! ), alongside three LEDs indicating the current performance bank; A, B or C. The A Bank button switches through these and also doubles as a Mode button. A dedicated 'Write' button, a volume knob and a value knob complete the controls. The rear panel is equally sparse, featuring quarter-inch left and right output jacks, a mini-jack headphone output, an aux input (again on a mini-jack), a 9V external PSU input and an on/off switch. The most obvious omission is any MIDI connectivity and, in these computer-dominated times, a USB port is also conspicuous by its absence. So, other than a change of colour, what's different about the Wavedrum Global? There are now 200 preset programs and 200 user programs (compared to 100 of each on previous models), including the sounds of the original Wavedrum (WDX) and the Oriental. More importantly, these are created using the 15 additional new DSP algorithms and 50 new PCM instruments for both head and rim, giving the Wavedrum Global a huge palette of sounds to play with. The Global also features all 140 play-along loops included in the Wavedrum Oriental, but doesn't add to these. I've used previous versions of the Wavedrum many times and, although I absolutely love it, there are certainly a few issues that have bugged me. Switching between presets using the value knob was not an instant process with earlier models. In fact, it took what felt like two or three seconds for the display to settle on the new preset number and the sound to become playable. Now, in mitigation, it would be fair to say that the Wavedrum sounds like no other instrument I've ever played. The way in which every part of the drum head and rim responds to your touch in an almost organic way is amazing and, I'm sure, quite a feat of The Wavedrum Global's interface is a simple affair, comprising two knobs, six buttons and an LED display. engineering, so I can understand why there is a small delay when selecting a preset. However, it does become quite irritating when you want to quickly audition sounds. As a way around this problem, Korg offered A, B and C banks, which could each store four presets for almost instant recall via the four buttons on the control panel. This actually works perfectly well and is certainly a solution for live performance where the delay inherent in selecting presets would be very inconvenient. So why am I telling you this? Well, preset selection on the Wavedrum Global is a vast improvement in term of speed. It's not quite instant, but it's more blink-of-an-eye than scratch-of-the-head! It also works much better if you should inadvertently land on the wrong preset; the previous Wavedrums had to settle on the preset number before you could change it. The Global lets you twist the value knob freely until you find what you're looking for. Another big plus point is the increased output level. The Wavedrum WDX and Oriental had a very low output level. There was a software 'fix' that allowed you to set the output to '2x' on boot-up, and although this did help, it appeared to be quite a crude amplification that also boosted the noise floor. Again, this issue has been rectified on the Wavedrum Global, which has a new parameter enabling the output level to be increased. Other new parameters introduced on the Global Edition include the ability to adjust the sensitivity of the head and the rim independently, which is very useful if you want to employ hand or finger techniques with any of the presets. The sensitivity that can be achieved is remarkable and, in fact, can border on the problematic if it's set too high! The piezo pickups in the head and rim not only pick up movement from the drum but also become extremely microphonic and can actually pick up ambient noises, so you need to be quite careful to set sensitivity correctly for both your playing style and the environment you are in. If you've never played a Wavedrum, you owe it to yourself to check one out. Not only are they sonically stunning, they are also incredible fun to play, and are some of the most uniquely creative electronic instruments around. The Global Edition includes the welcome refinements, in the form of increased output and faster preset selection, that I've described, as well as additional sounds. The last are, of course, a huge plus point, but the fact that they are used to create a selection of very usable presets makes all the difference. While big, swirling presets, doused in effects and almost being songs in themselves, are impressive, they can be next to useless in many practical applications. The Wavedrum Global, although blessed with its fair share of presets worthy of a film score, also comes with a vast number of immensely usable sounds (see the 'Astounding Sounds' box for my personal favourites). 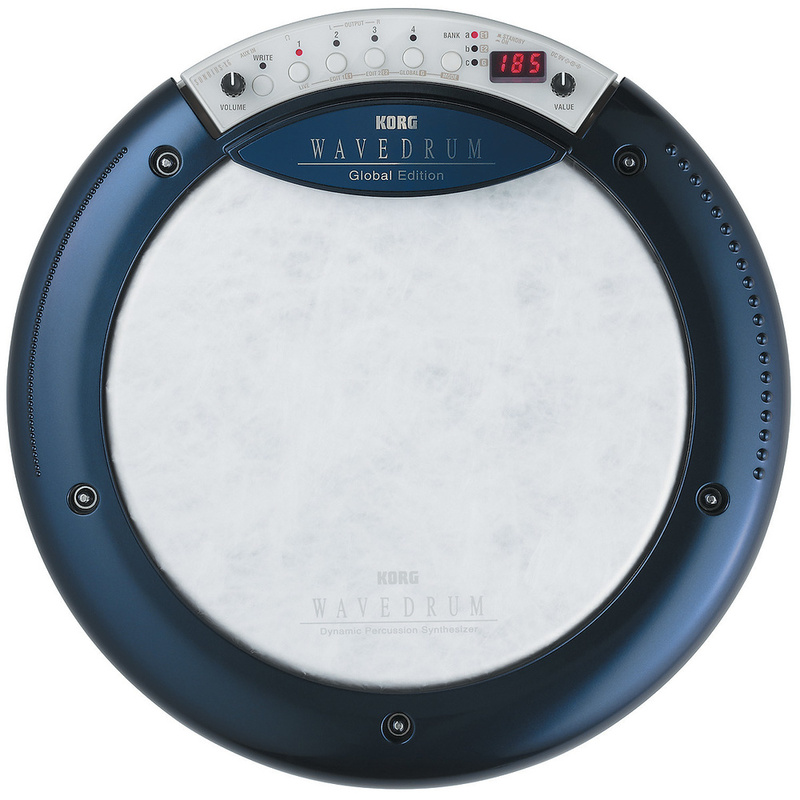 As Korg have made no changes to the fundamental physical design of the Wavedrum for the Global Edition, it still lacks a MIDI port and USB connection. 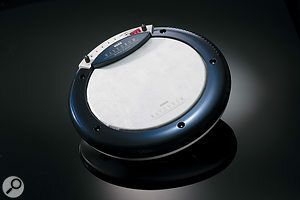 I appreciate that the unique way in which the Wavedrum generates its sounds (using a combination of PCM samples, physical modelling, synthesis and sound from the piezo pick-ups) means that using standard MIDI communication as a way of capturing a performance in your sequencer would be impractical if not impossible, but a combination of MIDI and/or USB as a way of connecting some kind of Mac or PC editing software would be very useful. The minimal LED display means that editing is very cryptic and requires the manual to be close by. Even a USB connection to allow for backup or storage of presets to a memory stick or hard drive would be a start. I'm already a huge fan of the Wavedrum, and the Global Edition is a big improvement on previous versions. For the stage or the studio, what better way is there to have access to most of the world's percussion instruments without even setting up a mic? Add to that some mind-blowing synth and sound-effect presets and you've got an incredibly useable, creative and fun tool, whose position in the market is only strengthened by the new version. There are some particularly outstanding presets in the new Wavedrum Global. Here are just a few of my favourites. 1 Snare 2: Great snare, works well with brushes. 15 Djembe: Deep and incredibly realistic. 28 Hot Salsa Combo: Very useable combination of conga/slap/shaker and clave. 35 Tabla Drone: Expressive Tabla preset with sitar and bells tone from the rim. 105 Egyptian Daf: Frame drum with jingles in the rim. 108 Bendir (double size): Very sensitive North African frame drum with snare wires. 152 Snare 6 Acrly: Ringing acrylic snare. 164 Timbale 2 Hi: Fantastic Timbale with great rim sound. 59 Snare/kick 2: Very usable Kick and snare combo affected by velocity and pressure. 67 Kenya Street Rap: Pitched log-drum sound combined with hats and snare. 46 Jews Harp: Great twangy preset! 48 Pressure Wah Drum: Aboriginal sounding with snare sound that mutes with pressure. 132 Egyptian String: Sitar-like sound that changes pitch with pressure. 77 Water SE: Atmospheric preset from the original '90s Wavedrum. 147 Bottle Synth: Eerie cross between a pot drum and glass bottles. Editing is tricky with a basic display. The Wavedrum Global really is an awesome instrument, taking the best of the previous Wavedrum incarnations and adding even more!